Documentation of the installation of Soft Spin, Toronto, 2015. Designed by Santiago Calatrava, the glass and steel Alan Lambert Galleria, sometimes referred to as the “Crystal Cathedral of Commerce,” features soaring glass and steel parabolic arches. 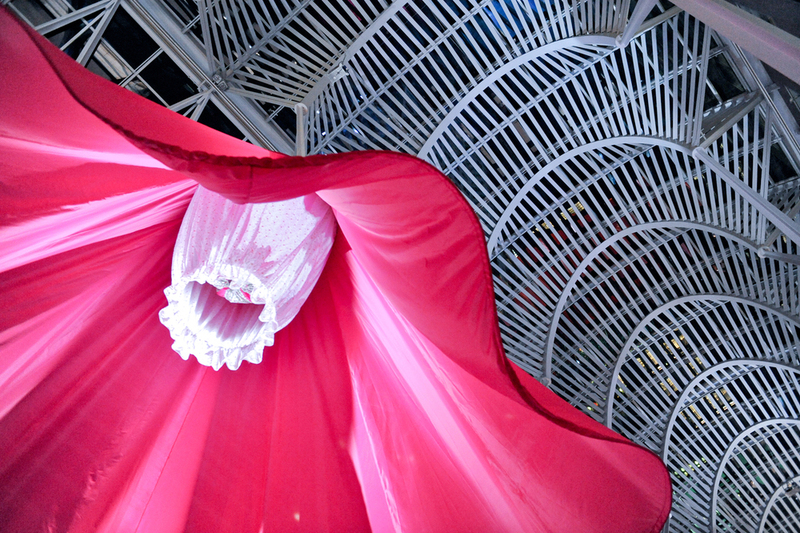 Soft Spin playfully interrupted the ordered symmetry of this splendid architecture with five gigantic suspended and spinning fabric elements. Unabashedly feminine, the work probes the boundaries of womanly presence in the heart of one of the world’s great financial and corporate centres - Brookfield Place, in the heart of Canada’s financial district. Colour, texture, movement, and decidedly flirtatious forms invited visitors to look up, offering unexpected drama and pleasure as they passed through the light-drenched pedestrian thoroughfare.